A new bill simultaneously introduced by Sen. Dianne Feinstein (D-Calif.) and Rep. Zoe Lofgren (D-Calif.) would amnesty over 253,000 illegal aliens in California alone by putting undocumented farmworkers on a pathway toward citizenship. This farmworker amnesty would extend to their families as well. Through chain migration, the amnesty could extend to a further 872,000 individuals. Nationwide, the total effect of this farmworker amnesty could exceed one million. The "Agricultural Worker Program Act" (S.175 and H.R.641) would confer a special status on individuals who have worked in agriculture for at least 100 days in the past two years. Feinstein's press release explains that these individuals would receive a "blue card" that would allow them to remain in the United States and work legally. After three to five years, those still on the blue card could apply for legal permanent residency (a green card) — the first step toward becoming an American citizen. When a farmworker receives his second-class, blue card status, his spouse and children would as well, even before being awarded legal permanent residency. Five years after receiving a green card, they can become citizens, allowing them to petition for their parents, siblings, and any adult children not already present in the United States. 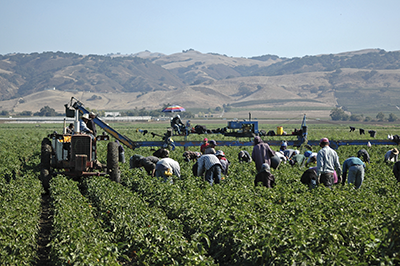 Immigration bills frequently wrestle with the status of undocumented farmworkers. Even Rep. Bob Goodlatte's (R-Va.) "Securing America's Future Act" included a provision to legalize most alien farmworkers through a nonimmigrant H-2C visa. This measure was even supported by the American Farm Bureau, who for years opposed mandatory E-Verify legislation and other enforcement mechanisms because of concerns it would obliterate farm labor. However, the blue card idea proposed by Feinstein and Lofgren goes well beyond an H-2C visa by actually putting these farmworkers on the path to citizenship. Amnestying nearly a million farmworkers and their families would be the largest amnesty since IRCA passed in 1986. Like IRCA, such an act would only encourage further illegal immigration into the country. This farmworker amnesty is likely dead-on-arrival in the GOP-controlled Senate. But crazier things have happened. Eleven senators co-sponsored the Senate bill, and as many as 58 co-sponsored Lofgren's House version. Further, many GOP senators come from agricultural states, and lobbyists from the agricultural industry are notorious for getting their way. Monitoring this bill's trajectory is important to ensure that a million-person amnesty is not quietly pushed through Congress.